WE'VE ALL SEEN THE SIGNS POSTED ON VACANT, GRAFFITI-SPRAYED BRICKS, STONE, AND WOODEN BUILDINGS--RECORD STORE CLOSING, FINAL SALE 50-80% OFF, EVERYTHING MUST GO, SPACE AVAILABLE, GOING OUT OF BUSINESS! It might take a little more than guts to keep a record and book store open with the rise of technology, but Melanie Cade, co-owner of Mojo Books & Music, damn sure knows how to keep up with demanding cultural shifts and trends. Cade and Drummond’s original location for Mojo on Fowler Avenue is located in the same plaza where their new location is today. Their old space is now IQ Outfitters Scrubs & School Uniforms. “If you went into that store, you would still see our industrial ceiling with sparkly brown paint over it,” Cade said. In the old location, Cade admitted that there were too many space constraints. “For some people it became claustrophobic,” she said. 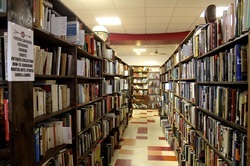 “Books were shoved here and there—anywhere you could fit them.” Customers were also limited in the amount of time they could spend in the store since the old location provided no access to a public bathroom. The store’s new 4,200-square-foot space is located a few doors down from the old storefront. 2540 E. Fowler Ave., Tampa, 813-971-9717, mojotampa.com. Even with the posed challenges, the move was exactly what the business needed. The 4,200-square foot space now allows customers easier access to buy, sell and trade everything from books and games to CDs, DVDs and vinyl records. What had already been in the space helped in part for Cade to decide what she wanted for Mojo’s look. “We decided to keep the original white ceiling and the circular hanging object from Washington Mutual,” she said. “Except before it was purple and had a weird looking alien thing in the middle.” Cade battled the alien, but kept the idea of the circle. She painted it red to go along with her business logo. With the new location, also came in an added coffee bar. “At our old space, customers had suggested we add one in,” Cade said. “I was thinking, ‘Oh God, one more thing.” She took her customers’ requests and ripped up the old carpeting from the previous bank. She added in Tetris tiles to go with the colors of the store and began to develop more of a personal interest in coffee. Cade’s coffee bar focuses on producing third-wave coffee, a current movement that creates the highest form of culinary appreciation of coffee. These crafters take their brews seriously, as if they were producing something as rich and similar to wine. “We offer a lot of brewing methods that you won’t see at a lot of other places,” Cade said. Having multiple components to the store provides more of a positive, group experience with a little something for everyone. "Some customers come in and out because they know exactly what they're looking for, but for others Mojo might be a half-day experience," Cade said. "Sometimes people will reappear from the book shelves and you'll think 'I can't believe that person is still here. They came in at the beginning of my shift.'" Cade hadn’t always known that she would be the owner of a book and record store. She described it as one of those things that she started falling into. “I didn’t have a formal background in music,” she said. “But I was really into classical music in high school.” Cade considered going in the music direction as a career until she started developing arthritis. She struggled as she tried to overcome the condition and play an instrument. “If I tried to move my wrists, they would snap every time,” she said. Cade went in a different direction and earned her bachelor’s degree in design and marketing, and later earned her master’s in business administration. 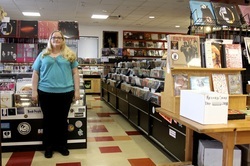 Although she was unable to play an instrument, she continues to remain passionate for music and plays records daily for her customers in store. “If you don’t hear music playing, it’s probably because everyone got busy and no one had time to flip the record yet,” she said. Music also runs in the family. Marcus Goldberg, the eldest of her three cousins, was a professional musician who was a vocalist and played a variety of instruments. He is no longer alive today, but is recognized for his talent. 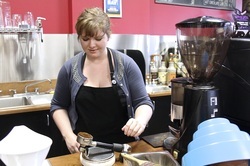 Andie Cunniffe is one of the baristas at Mojo Books & Music. Pictured is the slow-drip Yama cold brew for iced coffee. This drink takes 8 hours to make and is crafted daily. Mojo Books & Music specializes primarily in secondhand items, but also has a small collection of new items, including new vinyl. Seeing these past businesses fail might make a business owner think twice about opening another music and bookstore. Yet, under the ownership of Cade and Drummond, Mojo remains as an outlier. 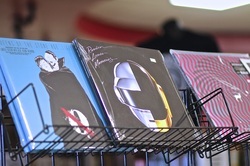 “It seems a lot of times when book or records stores have closed, it’s because they have gotten a little out of touch with where the market is going,” Cade said. “These places try to cling onto whatever it was they were doing before, whether that be specializing in new CD, record, or DVD releases.” Cade described those sales as high-risk, because often the merchandise isn’t returnable, “leaving those stores to fall by the wayside,” she said. 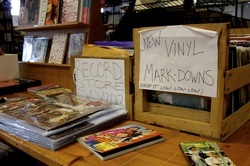 Cade would fall into a risk category if people stopped buying books and records from her store. If her business wasn’t able to transition with the sales, she admitted she might have to return to school. She must keep a close watch on sales and constantly revamp her inventory to avoid this risk. “At first we had cassette tapes in store, but at this point we don’t sell those anymore,” she said. “You really have to analyze sales. Sometimes you may personally think a genre is great, but sales might show that you might need to condense that category a little more and give room to another genre. Employees, like Robert Simmons, are hired specifically to shift through used goods brought in by customers. He must pay close attention to trends within the store and figure out ways to adapt sales to customer needs. Considering that the average customer in the store isn’t a top twenty listener, Simmons must look into what customers are listening to at the moment in the Tampa area. “This avoids overloading the system and receiving things we can’t sell,” Cade said. Very rarely does she buy new CDs, but she will specially order something at the request of a customer. When selling and trading records, Mojo looks for music categories in classic rock, indie, metal, punk, jazz, soul, blues, r&b, world, folk, reggae, electronic, soundtracks, and more. Robert Simmons selects through the books brought in by a customer. 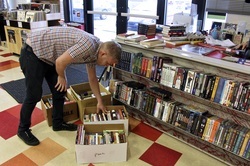 Customers can sell their used books, music, movies, and games for cash or store credit. With store-credit, customers get almost 40 percent more for their items than if they chose to receive cash. The buying/trading hours include M, T, Th, F, Sat: 12pm-7pm and Sunday: 12pm-6pm. Customers can also sell their textbooks to Mojo and it doesn’t matter where the seller originally bought them. She imagines that books may one day go in the same direction as records, since they have already begun to transition with turn of the century books now showcasing elaborate bindings, gold edge pages, and built designs in the covers. Some books have even started to include supplemental materials, such as discs inserted inside the cover. “It’s more than just content, but really more about the art that goes into delivering the work,” Cade said. “The physical quality of the publication is just as important. If you amp it up to the next level, it will become even more interesting to a customer." Cade admits that there’s even a science to knowing about content and format trends. She said she is constantly learning of different pressings, publications and printings. “And there’s still so much I don’t know about records, books, or coffee,” she said. “Any of these things could be a rabbit hole that you could jump down and learn so much more about." And as Cade continues to learn through experience, she must take on numerous roles at Mojo. “You have to wear a bunch of different hats,” she said. “You have to do accounting, keep track of books, coffee, and music, work with human resources, and physically do all of the functions in a business.” Often the phone will be ringing and she’ll suddenly have a line of people at the front desk with large boxes of things they want to sell. “And you really have to be able to handle those stressors,” she said. “It all comes back to you as a business owner. If something financially fails, it’s back on you.” Cade commutes to Mojo all the way from Sarasota, which is an hour drive to work. At home, she runs the online business where customers have the option to buy textbooks. 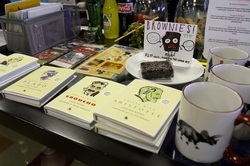 Classics can also be found on the coffee bar as well as brownies and coffee mugs. Mojo celebrates Record Store Day, an internationally celebrated day on the third Saturday of April each year. 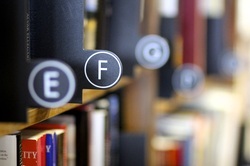 Its purpose is to celebrate the independently owned bookstores. Owning a small business does come with many advantages that can’t be denied. “Ultimately, there’s a great allure to not getting up at 7 am every day and doing the same thing,” Cade said. 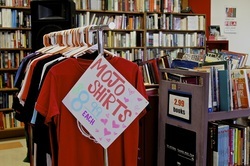 As a benefit, Mojo is a store that she is very passionate about and owning this type of business allows her to come into contact with good quality customers. “Our customers are here because they want to be. We aren’t selling a basic necessity, but rather we’re selling things that they can really enjoy.” Cade said that she is satisfied with offering things that can help the consumer develop intellectually. A downside to working closely with buying items from the public can be that people may place more value on their items than they’re actually worth. “People can get a little ‘pawn-shoppey’ on you,” Cade said. “Sometimes you can have that certain parade of jerks.” She said when people bring in tons of stuff in at once and she has to deal with difficult personalities, the work can become more challenging. “It’s really a matter of experience. You have to hold a knowledge about literature and music,” she said. “When you first start buying products from customers, you’re going to make mistakes.” And those mistakes can be costly, when a product might not be valuable to the sales of the store. Her customer base is always changing, from age to interests. Although one might assume that most customers are USF students with the location being so close to the University, this isn’t necessarily the case. “Customers are collectors, people who are looking for oddities or specifics, of you have your average readers who are just coming in the store for enjoyment,” Cade said. There are also those moments where Cade comes into contact with rare music and book collections. “Every once in a while someone will bring something in and you’ll think, “I can’t believe this person is parting with this,” she said. Typically in these cases it’s because the customer is moving or someone has died in their family. One of her most memorable experiences and collections came from a man in Sarasota. He left behind numerous boxes and never came back for the money. His father had recently died and left behind the collection to his son. “It was just one of those things where he didn’t want the stuff to go to waste,” Cade said. “He wanted all of the records that his father was passionate about to go to someone else who would appreciate it just as much." At Mojo, she often sees really focused collections, where the person was extremely serious about what they were collecting. “And sometimes you just see other things beat to hell at places like the Salvation Army. And clearly whomever that stuff was passed down to, didn’t have the same perspective or appreciation that their relatives did.” Cade said it would be nice to think that whoever cares for your possessions would treat them with serious care and consideration. 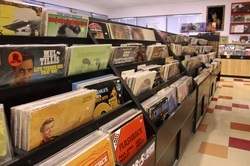 Around the store, customers can also find rare pieces on the “red wall” of the store, which holds the rarest collections of records. They can also enjoy odd pieces of memorabilia ion the tops of the bookshelves, such as the old 60’s and 70’s Beatles figures or the framed velvet crying Elvis hanging on the wall of the store. Sadly, Elvis isn’t for sale. 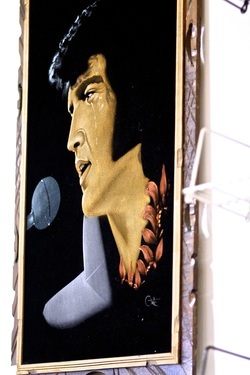 On the top of the stacked shelves throughout the store, customers can find memorabilia pieces such as the velvet Elvis pictured here. 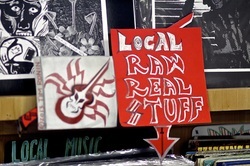 The business supports local artists and musicians by selling their merchandise and allowing the bands to perform in store. 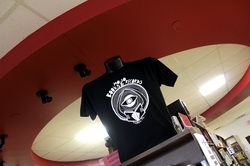 Mojo Books and Music is located at 2540 E. Fowler Avenue, Tampa FL 33612. Store hours are Monday-Saturday: 9am-10pm and Sunday 11am-7pm. For other small businesses in the Tampa area, Cade hopes to see more collaboration in Tampa compared to other equally sized cities. “Everything seems so spread out,” she said. “In Tampa, there is such a delineation from Seminole Heights to South Tampa, from Carollwood to Lutz. When you talk to people in other areas about Mojo, they think you’re talking about Antarctica.” Cade said she wasn’t sure if an improvement would be to have more regional segmentation where people could collaborate in those particular, targeted areas. Cade said the USF area could work to have an alliance. “We could communicate more to students about local independent businesses,” she said. “There’s so many really interesting businesses that I don’t think students find out about until they’re at the end of their degree.” Cade said that it would helpful to create a guide targeting these students to become more educated about the businesses in their area. In other locations like Austin, Texas, the Independent Business Alliance has adopted the slogan “Keep Austin Weird,” to promote small businesses. “These cities do well to put a social pressure on people to shop and value small businesses and uniqueness in a community,” Cade said. There’s definitely a role for big box stores and chain businesses, but Cade said there are small businesses that could add to your life if you are willing to discover them. Culturally, more people are becoming more aware. Cade said there is a small appeal to small businesses that really wasn’t there ten years ago. Melanie Cade is currently reading The Angel Esmeralda: Nine Stories by Don DeLillo and is currently listening to The Handsome Family, composed of Brett and Rennie Sparks, an Albuerque-based duo. Brittany Cagle works as a creative writing instructor and writing consultant at the University of South Florida. Her poetry and prose has most recently appeared in Spry Literary Journal Issues 2 and 4, Sweet: A Literary Confection, Welter, Mad Swirl, and is forthcoming in The Stray Branch and The Poet’s Billow. Her poetry was recently nominated for the 2014 AWP Intro Journals Award. Her poetry chapbook, My Family Sleeps in New Beds, was selected by The Poet’s Billow for the Pangaea prize, submitted to Best New Poets anthology, and nominated for a Pushcart Prize in 2014. All photographs taken and owned by Brittany Cagle.